The main goal of this guide is not a comprehended tutorial on picking or choosing the best arrows for recurve bows. Rather, this serves as a comprehensive guide for people like you who are looking forward to using archery as an outdoor or recreational activity. You could spend so many days searching for the best and most appropriate arrows for your recurve and without a thorough knowledge regarding these stuffs you would only find yourself even more confused than you were from the start. With this review, you will be able to discover what particular type or brand of recurve arrows play well in the market today. 2 What is a Recurve Arrow? What is a Recurve Arrow? Based from the name itself, one can easily point out the meaning of a recurve arrow. Simply put, this is an arrow which is specifically used when using a recurve bow. A recurve bow is a kind of bow that has limbs that typically curve away from the archer when unstrung. This kind of bow also stores more energy and delivers energy in a more efficient manner compared to a straight-limbed bow. As such, a greater amount of speed and energy is provided to the arrow. There are some differences that you can find out between a hunting arrow and target arrow shaft. However, the most significant difference is the arrow’s total weight. Suffice it to say, the heavier the weight of an arrow shaft, the deeper its penetration would be on the target. However, a heavier arrow shaft tends to lose its velocity faster due to higher kinetic energy involved. If you are practicing to target, much deeper penetration is not necessary as you only look forward to piercing some cardboard or compressed foam. But if you wish to go hunting using a recurve bow, your arrows require deep penetration as your shooting should be able to go through thick layers of muscles and fat and even bones. As you look around the market, you will be delighted to see a plethora of arrows which are specifically made for recurve bows. However, the sea of choices may seem to make you feel overwhelmed especially when each product claims to be the best. And as you continue with your search, you will realize that as far as recurve arrows are concerned, the following things prove to be very important: fletching length, materials, arrow weight, different nock points, diameter, and many others. Without the need to spend countless hours researching and looking for this subject, here is a comprehensive review of the three most popular arrows for a recurve bow on the market today. 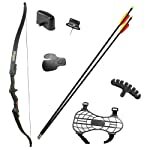 At the end of this review, you can get to your feet real quick with some good, quality, universal and reliable arrows. These arrows are considered to be universal and versatile because they can be used for your traditional bow, long bow or recurve bow. They are also excellent choices when you are target-practicing or going out in the outdoors to hunt. 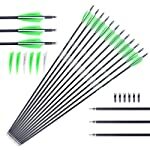 As for the measurement of the arrows, each arrow comes with a length of 80 centimeters or 31.5 inches, a shaft diameter of 0.8 centimeter or 5/16 inch and a spine of 450. Black Archery 31″ Carbon Fiber Hunting/Targeting Arrows fletch with 2 red, 1 black and 5-inch peltate shape genuine feathers. Each arrow comes with a 100-grain nickel-plated stainless steel bullet tip which is perfect for targeting or hunting practices. Every arrow weighs 30 grams, making it as an excellent choice for both targeting and hunting. These arrows perform with excellence, rendering low hand shock with a good sense of speed at the same time. And as far as durability is concerned, these arrows are extraordinary you can rely on them for extended use. Another name that rings the bell of bow shooting enthusiasts is the 30’’ Inch Carbon Arrow Fletched. Arrows are more consistent with their thick walls. The shafts are made of composite carbon so you can rely on them in terms of longevity and durability. Thus, you will no longer have to keep on buying arrows for your recurve should your formers ones become easily damaged. The arrows are matched with a 100-grain point with field points and fletching nocks as well. All of this contributes to the ability of the arrows to render maximum accuracy, deep penetration and a great sense of durability. Not sure about field points and nocks? A field point refers to the tip of the arrow. On the other hand, a nock is commonly attached to the arrow, next to the fletching. 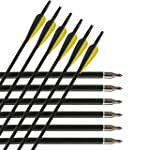 Screw tip arrows are of top quality, featuring a black carbon shaft, plastic vanes and an extra hard steel target point. Indeed, these arrows are a perfect choice for bowhunting, targeting and archery practice. Emerging as one of the most popular recurve bow arrows on the market today is the M.A.K Carbon Outdoor Archery Practice Hunting Arrows. These arrows are solid in composition and are well-made, infused with precision pure carbon made for extended durability and long lasting target practice that you can always count on. The high-tech carbon material construction manages dynamic spine in a new way, making broadheads fly better and shoot in a more consistent manner. These arrows are thoroughly checked in terms of their straightness accuracy, boasting of a remarkable 1/10,000 inch per arrow. The M.A.K Carbon Outdoor Archery Practice Hunting Arrows also come with colored plastic fletching that makes flights always pointed at the right way and to the right direction. The tips are nickel-plated stainless steel, making these arrows a perfect choice for target practice and outdoor shooting. The fletching, nocks, and head of the arrows are replaceable and replacements also come for free. Since the nocks are not fixed with glue, rest assured that they can be adjusted depending on the kind of bow you are using. M.A.K Carbon Outdoor Archery Practice Hunting Arrows are not advisable for shooting any hard substance or concrete walls as this can damage the arrows. It is also highly advised that the right kind of bow should be used. You should also remember that shooting from a bow with a draw weight above recommended value may damage both the arrows and your bow. Always make use of an arrow rest to protect the bow from being damaged by the arrow. While there are many names that claim to have the best arrows for recurve bows, the three products in this review prove to be an excellent guide that will lead you to the one that is simply made best for you.